Not one of my better pictures but you can see how the porcelain cleats are used. This shows four cleats on a bracket, most common is three, sometimes two and for business sometimes five. 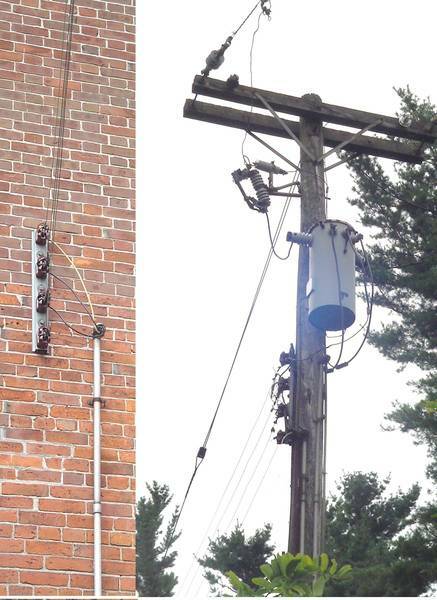 One bracket is on the service pole and a second corresponding bracket is usually on the building. 2 & 3 on a bracket are almost always the same colour, brown or newer manf., gray. In most 4 cleat installations, one would be usually white. In a 5 cleat installation there is usually a white and a blue. On any 5 piece units I have seen, they are a heavier cleat, as shown on the right in Fred's picture. [id=537570129] [id=525383242] In this picture all 4 are brown. One wire is a return to the pole to power the yard light. Had there been four wires running to the house, one would have been white.